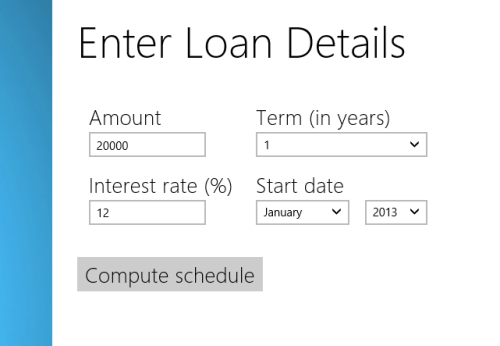 Windows 8 Amortization Schedule Calculator is a nice tool for creating a schedule to get out of debt. Well! it will not arrange money for you nor is related to any Get-Rich-Quick scheme. What Amortization Schedule Calculator does? Is provides assistance in creating a schedule for repayment. The nice thing about this Amortization Schedule Calculator for Windows 8 is that it’s quite straightforward to meet requirements of all, irrespective of the business or profession. On launching Windows 8 Amortization Schedule Calculator, you will be provided with a form asking you to enter loam amount, term of loan, interest rate, and beginning of loan term. Once you have specified those details; click on ‘Compute schedule’ button and soon after that you will be provided the Amortization chart. The ‘Principal’ column denotes the amount which you require paying per month in order to get out of debt. You always have the option to go back by click on the backward arrow on the ‘top-left’ section and try adjusting the amount, term and rate of interest. Unfortunately, you will face difficulty in storing the chart or to take a print out. The solution for later will be to implement a print-screen app and take printout later. Management is likely to become difficult for the person who have opted for multiple loans. The app calculates the principle for a single loan at a time. Provides no adjustments if the borrower wants to pay principal with some deviation from suggested amount. Also, check out our posts on Calculator Apps, Stock Apps, and Expense Tracker Apps. 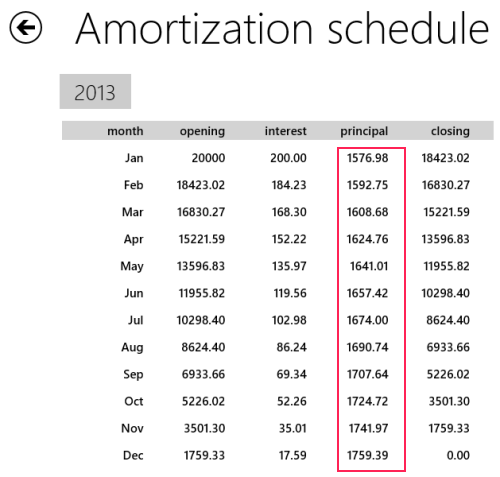 Windows 8 Amortization Schedule Calculator can be easily located under ‘Finance’ section of Windows Store. This app is 100% free to install and use. Open this link in any supported web browser (Internet Explorer 10 or later). Then proceed by clicking on ‘View in Windows Store’ button after which you will be redirected to the Windows Store. Now, click on ‘Install’ button and this 403 KB app will hardly take more than a minute to install. The application might appear quite simple, but it’s the simplicity that counts in case of Windows 8 Amortization Schedule Calculator. Also, it saves you from hectic calculations. Amortization Schedule Calculator works best for finding EMI for the loan you indent to acquire. you can press windows key + h or use the charm bar to share the amortization schedule through mail. the mail then can be printed if required.